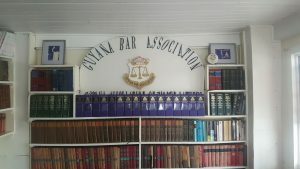 Guyana Bar Association’s office. Brickdam, Georgetown. The Guyana Bar Association (GBA) on Thursday urged the Minister of Legal Affairs, Basil Williams to heed an order by Chief Justice Roxane George-Wiltshire to activate the Judicial Review Act, a move that could pave the way for ordinary citizens to seek redress against the State easily. “The implementation of the Judicial Review Act is of vital importance to good public administration in a democratic society, allowing citizens ample remedies against the State and leveling the playing field. The Bar Council looks forward to the speedy implementation of the Act,” the GBA’s Bar Council said. The Association’s call came less than one week after Williams, who is also the Attorney General, suggested that the Chief Justice violated the separation of powers between the executive and the judiciary. He has also signaled that government might appeal the Chief Justice’s decision right up to the Caribbean Court of Justice, and that government wanted to hold consultations and amend aspects of the law. With the Attorney General saying that the Judicial Review Act could still be applied with the old rules instead of only through the new Civil Procedure Rules that were brought into force in 2017, the Bar Association registered its disagreement with that reasoning and pointed to a recent CCJ ruling. “The Bar Council notes that the implementation of the Act fills a lacuna in the new Civil Procedure Rules 2016, which contains procedure contemplating remedies under the Act. In the absence of this Act, litigation in this vital area of the law has been stymied and fraught with a number of procedural hurdles some of which were laid bare in the recent CCJ’s ruling in the case of The Medical Council of Guyana v Jose Ocampo Trueba, CCJ Appeal No. 2018/001, where the Honourable Court declared that prerogative remedies were no longer available in Guyana,” the association stated. In welcoming the Chief Justice’s decision in the matter Mohabir Anil Nandlall v The Minister of Legal Affairs, compelling the implementation of the Judicial Review Act, the GBA noted that it had also raised the issue with Williams at a meeting on July 22, 2017 and in a letter on July 22, 2017.